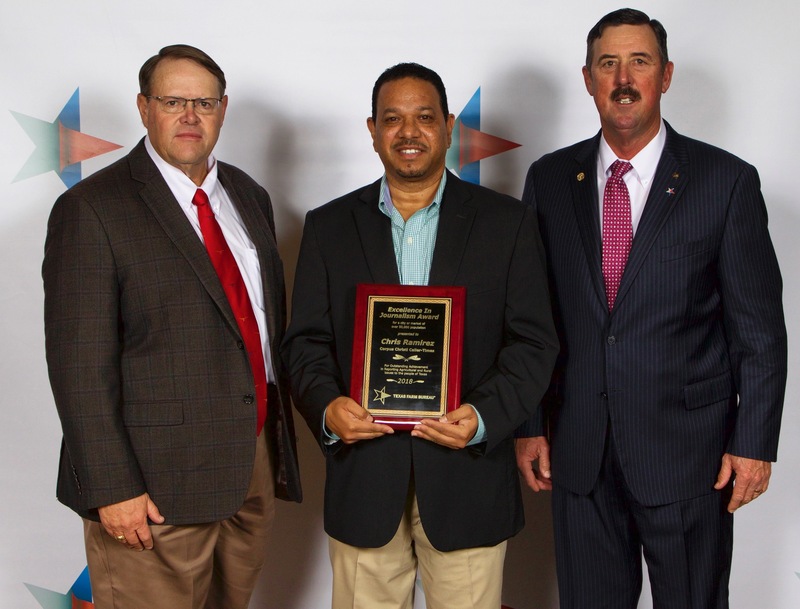 (CORPUS CHRISTI, Texas)—Texas Farm Bureau (TFB) honored Chris Ramirez, an editor for the Corpus Christi Caller-Times, with its 2018 Excellence in Journalism award for outstanding coverage of Texas agricultural issues. Ramirez received the award during TFB’s 85th Annual Meeting Dec. 2 in Corpus Christi. Nueces County Farm Bureau and San Patricio County Farm Bureau nominated Ramirez for the award in the category market of more than 50,000 in population. The Corpus Christi Caller-Times covers important issues—including agriculture, trade and youth activities—for the region through its print publication and digital editions. “Mr. Ramirez has been nominated for his continuous support over the years in working with the producers and families of the local farming communities with updates in the news on current progress in agricultural issues, seasons, projects and activities,” the nomination stated. As the metro editor, Ramirez has worked with farmers and ranchers in both counties to cover agricultural stories important to local and state economies. The nominating counties also highlighted Ramirez’s management of the coverage of the Nueces County Junior Livestock Show in January. For his coverage of agriculture, Chris Ramirez received the 2018 Excellence in Journalism award today at Texas Farm Bureau’s 85th annual meeting in Corpus Christi. Ramirez is the metro editor for the Corpus Christi Caller-Times.